OK… follow me on this… the container in the pictures was upside down where Jake is standing in the first picture. When we went out in the yard Jake KNEW there was something underneath it so was fixated on it. Brita and I walked by and he was digging away. As Brita and I get to the other end of the yard I started calling and whistling for Jake because I wanted him to get some running in but he didn’t come. ok.. I figure hunting won which usually doesn’t happen. As we head back to the house we see and pass by the upside down container about 4 feet away from where it was when he was digging. I figured he got something and is somewhere in the yard with it recalling one time that he took about 30 minutes to eat a rabbit. More calling… no Jake. Then it dawns on me…. he took whatever it was he got into the house! (eewww… recalling the rabbit, squirrel, dove, and possum) So …..Brita and I walk into the garage, through the first floor, down through the basement and out to the garage …. no Jake. As we head back out to the yard and pass by the container I said to Brita “what’s under there” as I lifted the corner up. Much to her delight a LIVE mouse runs out… (temporarily live mouse) so now Brita is very interested and I’m wondering what really is under there. A note here… Both dogs were outside barking early this morning and there have been wayward possum and probably other critters in the yard in the past so I really wasn’t sure. AND THEN IT HIT ME! JAKE IS UNDER THE CONTAINER! So we lifted a side up and yup… out he comes! Somehow when he was digging it out it flipped over on him – 4 feet away! How do things like that happen anyway!?!? So here’s the lesson. What if this would have happened when I was away. He was not indicating at all that he was there and was simply waiting to be rescued. What if it had been summer and hot…. that I hate to think about. We walked by it several times and he never moved and Brita paid no more attention to it than she did any other time we passed it. IT IS NOT THAT HEAVY and he could have at any time simply stood up! What a goof he can be but it sure is scary at the same time!! It can’t be said enough…. I’m certainly looking forward to spring wondering how Jake will react after not seeing rats for 4 months! 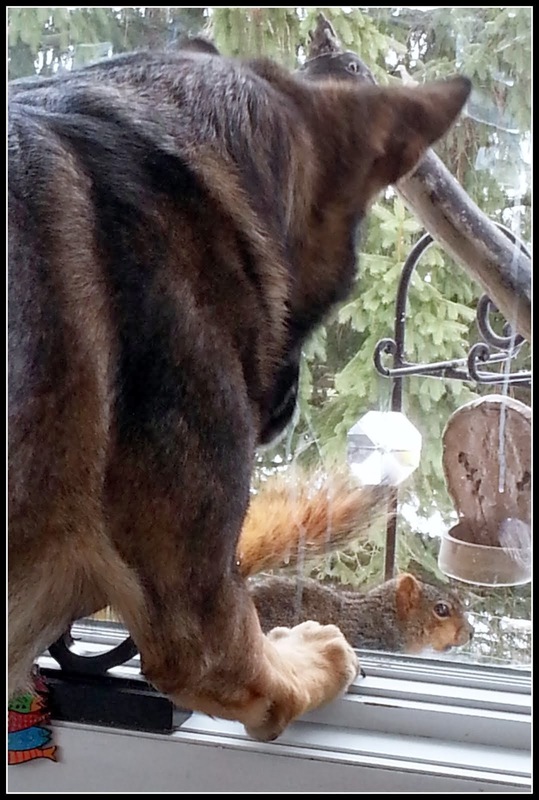 Perhaps the squirrels and rabbits in the yard will keep him entertained so he doesn’t forget his job! Close to home!! Woohoo! And Jake finished the season with three 1st place finishes and a High in Class ribbon!! I took the ribbons to the yard to get a picture, carefully hung them in the shed with the straw and tried to round him up. Well.. apparently getting his picture taken did not hold a candle to the fun of running through the yard after critters, hawks, other birds, the neighbor’s dog, people on the road, the school bus or any other vehicles, etc. because he pretty much pouted when I tried to get him to pose for a photo! All he did was look out of the shed at Brita who was waiting patiently for him to come back out and play! OK… truth be told… He does look happier sniffing for whatever is in the woodpile with Brita!! Participating in a dog sport is not just what happens for a few minutes in the ring. It's the relationship that develops between a person and his or her dog. The time in the ring is simply one of the moments in time that is spent together and the title is successful outcome of the training and time spent together. Quite honestly, if anyone wants to compare unsuccessful times in the ring in any sport, I guarantee that I probably have a huge lead on number of NQs after competing in not just AKC/UKC obedience but also in Schutzhund/PSA/SDA protection sports with what I refer to as my previous generation of dogs. I often said that failing is what made me a better dog trainer, what showed me where my training weaknesses were and what ultimately made us successful. Have I driven across country only to NQ a minute into the time on the trial field? .... you bet. Did my dog care? oh... probably not, he was just excited that we were on an adventure together. Recently I posted to the Great Lakes Barn Hunt Facebook group some stats about how Jake has done since we started a year ago. Someone pointed out that I didn't list the cost of getting to RATCHX2 .... yep that's correct... There are some things I simply don't want to know how much they cost! Last and not least of the what I get out of competing, whether I win or lose, is the opportunity to meet new people and make new friends!! And always... it's about having fun with my dog! Thank you to the Sheboygan Dog Training Club for the gift certificate so I could purchase this amazing personalized necklace and bracelet to celebrate Jake's RATCHX2! And thank you to Shelley who put up with me deciding how I wanted them to look! Shelly's Etsy page is at www.etsy.com/shop/MACHmyday and she is amazing and very patient to work with! Heather Neldner, Candy Henely, Becky Harrison Focht and 37 others like this. Tammy Milbrath Strebe Just perfect! Becky Kamp Malivuk Ribbons are nice..but this can't replace the every day use and closeness to your heart while wearing this. What a lovely idea! Jeanette Showalter Rausch Very nice! Huge congrats to Laurel and handsome Jake!! !